So here I am..relaxed from a session with Pauline at Senspa. I can now write my race report! 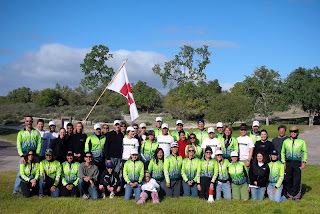 This weekend was our "Halfway to Iron" training weekend. Deb, Matt (Deb's roommate) and I left for Lake San Antonio, the site of the infamous Wildflower Triathlon events for a weekend of food, fun, no sleep, camping, Ted's food, Larry and Nick's cooking and of course training! We arrived Friday around 3pm..set up camp and then just hung out and relaxed a bit. Had dinner with our mentor groups and then off to bed we went. 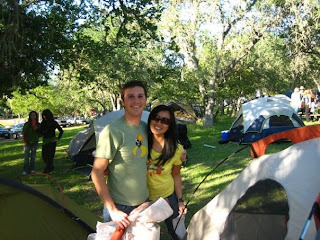 Anthony and me at Redondo campsite- helping Anthony set up his tent. Saturday 5am arrived. I didn't hear my watch alarm because my ear plugs worked really well apparently! I woke up at 5:15am..walked out of my tent to hear Ted's boom box playing the theme to Rocky! 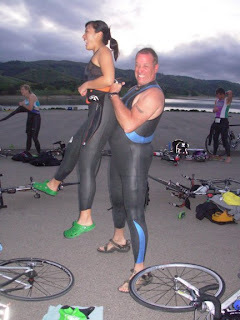 Deb and I drove down to transition at around 6:15am for the 7am swim start. Swim...the swim at Wildflower is always interesting for me. I can't swim straight when I have so much room for error!! I saw the first white bouy..and then I just followed Alex's bobbing red cap for the rest of the way until the turn around. I zig zagged all over the place to finish the swim in about 53 minutes I think? The Vineman swim took me short of 45 minutes so I have a little bit of work to do here...OR TriCal can just put lane lines in the lake!! How's that for an idea?! Mike Kyle giving me a wetsuit wedgie- I got air! Out of transition..I am usually pretty speedy in my transitions and this time was no different. Off on my bike I went with Deb. We got a little lost in the beginning biked up a little steep climb unnecessarily before finding our way. The 56 mile bike ride was not bad at all! Weather conditions were perfect. No out and back..just a big loop! Prior to the ride, Mike Kyle had talked about the beautiful wild flowers out in bloom..so that's what I was looking for during the first half of my ride..no flowers..what the heck?! They did appear later though. So here's my thing with long distances on the bike..the last few miles always kills me mentally. It just goes so slow! To deal with this, I halved my distance which in this case is 28. I concentrated on getting to mile 28 and then past 28, I started to double the distance and make believe that double the upcoming distance was my final destination. For instance, I got to mile 30..and thought to myself..ok..60 more miles to go. It worked for me as I was able to mentally hold on for the entire distance. Sounds weird I know but it works for me. I got to mile 42 where the infamous Nasty Grade appears. I was happy to see Coach Ted (he was doing hill repeats coaching us up the climb) as he came up next to me and asked me how I was. He asked if I was saving my gears and I said, "oh yea!" In a few minutes, Nasty Grade was over and it really wasn't all that bad. I thought Beach Hill was worse! From my conversation with Deb (from her conversation with Rosie), I knew not to think that the ride was easy and over past Nasty Grade. I kept telling myself that it's not over..there are still climbs..it's still going to push me. Knowing that helped me get to the bike finish mentally healthy! Dropped off the bike, popped a thermolyte and off the run I went! I concentrated on getting to the halfway point of 6.5 miles on the run and thus getting to the full 13 miles was mentally easier for me to deal with. Everyone talks about the bike when it comes to the Long Course but what should really be talked about is that run! My goodness! They should really call it a hike! At one point, from afar, I saw this gravel mountain top thinking..there's no way we have to go up that thing..well a few minutes later..what do you know? Heck yeah we do. Holy mother of ...!!! Anyway, I got to the finish line having completed the Long Course in it's entirety and the only real pain I felt were the blisters that formed on my pinky toes. Not bad for having a two week taper! Nutrition wise- I had a peanut butter sandwich for breakfast. On the bike, I packed two 400 calorie bottles of sustained energy and hammer gel to flavor (chocolate and vanille). I estimated that it would take me about 4 hours on the bike course and knowing that I can digest about 200 -238 calories an hour..the two 400 calorie bottles should be able to hold me for the entire ride...and it did but I did much on a pack of sport beans as well prior to Nasty Grade. On the run, I took in a bottle of Infinit and two hammer gels..one at the beginning of the run and one at the halfway point. Nutrition wise..I think I did pretty well as I felt good! 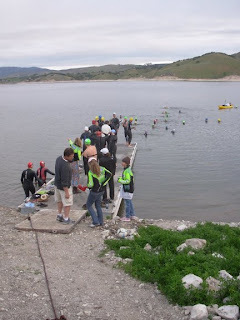 So..a little over a month from now..I'll be able to do the Long Course in it's entirety again! This time with a whole lot more hoopla and support on the course! 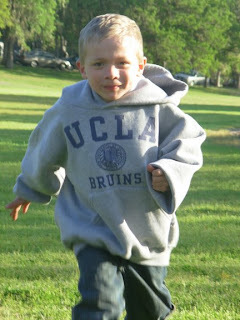 One of our honorees- Tyler! So cute! 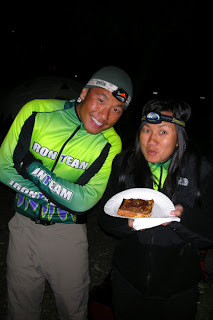 Doug and I (hm...Ted's grilled cheese..yum)- Saturday night- Wildflower Long Course- check!